Ramon Wayne McGuire was born June 13, 1950 at 4:01 AM at Grace Hospital. Vancouver, B.C. He weighed 6 pounds, 5 ounces. When Ra was six weeks old I took the car to go and get some meat before Mickey left for work. I was crossing Kingsway at Knight road, when a wood truck coming North on Kingsway went through a red light and hit my car just behind where I was sitting… and broke my shoulder blade… again. Mickey’s aunt was supposed to come every day (for pay) to look after Ra but she wouldn’t show up until two or three o’clock. So I would take my arm out of the sling and bathe him etc, myself. Anyway, because of the accident I couldn’t nurse him any more. Dr. Telford put him on a formula (SMA) which didn’t agree with him and the doctor came to the house and gave him an injection… adult size… and Ra went into a convulsion. We rushed him to the hospital where he stayed for about ten days. 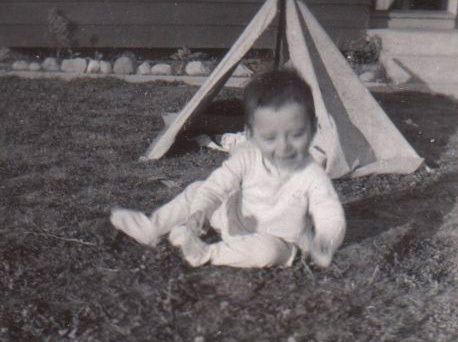 In 1951, when Ra was eleven months old we moved to Townline Road in Surrey. The idea of moving to Surrey was to be near the piece of property we had bought along with his parents. Mickey wanted to clear the property and start building a house for us. We rented a three room house… front room, kitchen and bedroom, with an outhouse and a well. You had to get the water from the well, heat it on the wood stove, and wash the clothes in a tub on a scrub board… then pack the water outside to dump it…. And hang the clothes out on the clothes line to dry! In regards to the property. We owned half of a five acre piece, but it didn’t work out, so it was sold. I became pregnant again… and Mickey had a car accident on the way home from work and broke his arm. As we didn’t have a phone, Mickey’s parents were notified. Although we lived less than a mile from them they never bothered to let me know what had happened until the next afternoon. I’ll never forget how much I worried, wondering what had happened to my husband. Road. Still no water. Had to carry it from their place from a tap in the garage. .
December 3rd, 1951, Danny Clarke McGuire was born at St. Mary’s Hospital in New Westminster at 9:21 AM. He weighed 6 pounds, 15 ounces. In the hot weather, the little house where we were living was like an oven and you couldn’t stay inside. Mickey was having to drive back and forth to Vancouver to go to work and it was not very pleasant for me living there, so we decided to get out. In May 1952 we moved to 2447 E. 19th in Vancouver, to Mike and Rosie’s basement suite, with a bathroom, a wood stove and no fridge! No washing machine! No telephone! No drawers! No doors on shelves to keep dishes in! 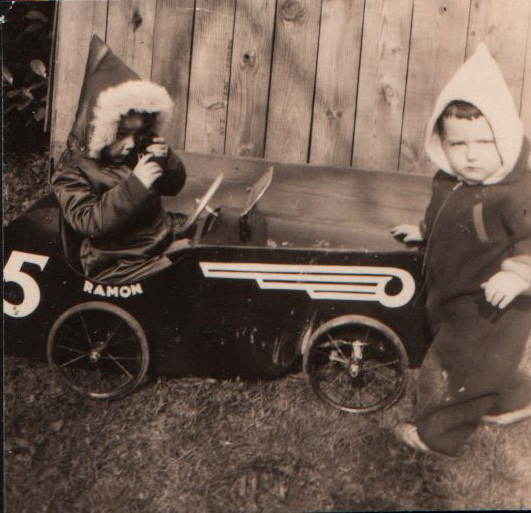 November 19th 1952, Gary RusselL McGuire was born in St. Paul’s Hospital in Vancouver.. 6:55 P.M.. He weighed 6 pounds, 7 ounces. At that time you stayed in the hospital for a week after giving birth. I came home from the hospital with Gary and both Ra and Danny had whooping cough. My mom had been staying there to look after the kids but poor Mickey wasn’t getting any sleep either from being up most of the night with them coughing. We had three little kids… Mickey got a small raise, so we bought a fridge and a washing machine! What an improvement that was! Part of the time our landlords, Mike and Rosie, were friendly… but part of the time they weren’t. The morning of December 24th, Christmas Eve, they came and took our table and kitchen chairs away. They were part of the “furnishings” that we rented! Luckily I was able to phone the store where we had bought the fridge and washing machine, and we bought a yellow chrome dinette suite, sight unseen, and they delivered it that afternoon! We found another basement suite on Inverness, not far from Kingsway. It was almost impossible to rent when you had kids… and we had three of them! 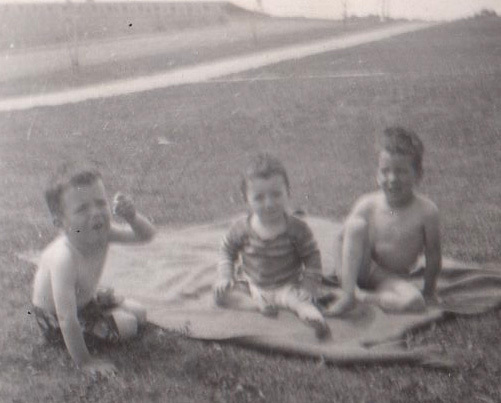 We moved June 13th, 1953, Ra’s third birthday, and had a family gathering the following week for his party. The night before, I was busy in the kitchen getting some things prepared for the party… I heard our car start up. I called my husband and he ran out in time to scare off the car thief. This place was small, with a wood stove. Our washing machine had to hook up to the kitchen sink. We had put our name in for one of the Veteran’s homes in Fraserview, and had supplied a letter from our doctor saying that dampness in the basement suites was not good for the health of our family. They came to inspect where we were living to see if we were really eligible for one of the veteran’s homes. They picked a perfect time. My folks were visiting and I was doing a wash, so there was more of a commotion than usual. We only had two small bedrooms, and Gary’s crib was in the front room. Anyway, we got the OK, and in August 1953 we moved to 7750 Muirfield Drive. It was a Brand New House! Such a time for being unsettled, with the three little lads. I can’t begin to imagine! What a blessing you were able to get the new house – finally a break, and a well deserved one, too! Thanks for coming by Heather. I’ll pour your tea! Muirfield was like a dream when we moved there…. and we spent 35 years in that wonderful house. What a time you had!! The new house couldn’t have come along at a better time, and it served you well for many years. Morning’ Carol.. Teas ready. Thanks for coming by. That was a good l\place to live, all 35 years of it. Glad you moved to Muirfield Drive. I remember all the fun we had as kids that lived on my block and the turn around. I often tell everyone how great it was to live there as a kid. 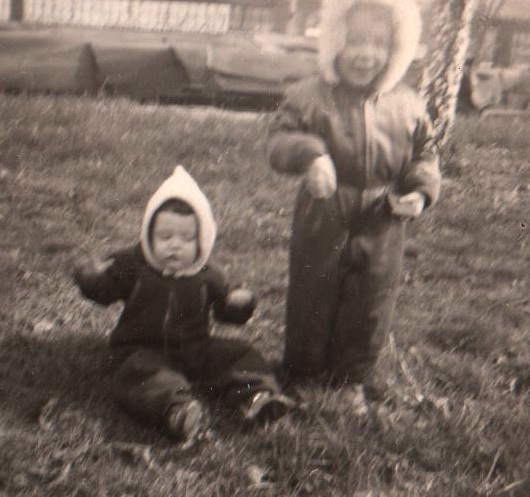 We had all the fun of the bush behind us (the two big rocks that were the stage coach and horse LOL) the park and school right across the road eventually and all the comforts of city living. What a great life it was for us kids. My dear Bev! So good to see you here… we go back a few years, don’t we. Tea? Cream? sugar? I guess you remember your mom always trying to get Ra to sing… of course he was always ready to sing… and is still doing it. Thanks for commenting so I know you are out there. I remember you all well. And the seasonal windows, painted for Christmas, etc. What a journey it took for you to make it to our Muirfield Drive!